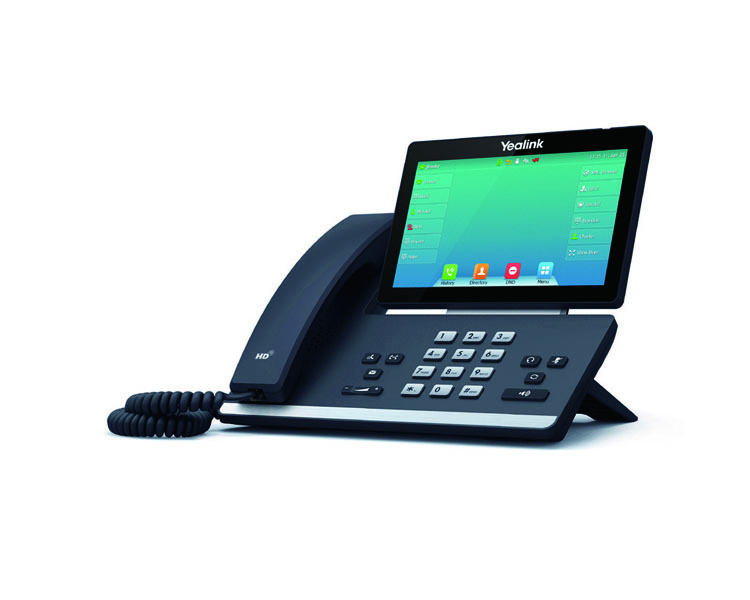 The Yealink SIP-T57W is an easy-to-use Prime Business Phone with an adjustable 7-inch multi-point touch screen that you can not only easily and flexibly find the comfortable viewing angle according to the personal and environmental needs, but also get a rich visual presentation and easy navigation with just one-touch. With the built-in Bluetooth 4.2 and the built-in dual band 2.4G/5G Wi-Fi, the SIP-T57W IP Phone ensures you to keep up with the modern wireless technology and take the first chance in the future wireless age. Its built-in USB 2.0 port allows for USB recording or a direct wired/wireless USB headset or up to three Yealink EXP50 expansion modules connection. Benefitting from these features, the Yealink SIP-T57W is a powerful and expandable office phone that delivers optimum desktop efficiency and productivity. Yealink SIP-T57W IP Phone features an adjustable 7-inch capacitive touch screen that you can readily adjust it to the comfortable viewing angle according to yourself. In addition, clearly defined set of menus is easy to navigate through when all you have to do is touching the desired option, that ensuring you an optimised interface for smartphone-like user experience. Yealink SIP-T57W IP Phone not only furnishes you with the built-in Bluetooth 4.2 for Bluetooth headsets and mobile contacts synchronisation but also the built-in dual band Wi-Fi for Wi-Fi connectivity, allowing you to access the 5G Wi-Fi connectivity handily. Also if you want to expand your horizons for busy environments, or, share one phone system with your small team by adding multiple handsets, just simply turn your IP phone to the corded-cordless phone via DECT technology. Moreover, the IP phone can function with Yealink VC Desktop together to share content from your laptop, making collaboration much easier than before. VoIPon - your Yealink SIP-T57W Prime Business IP Phone[SIP-T57W] distributor, supplier, reseller! Get all your wifi at VoIPon! If you would like to be notified when the"Yealink SIP-T57W Prime Business IP Phone" is re-stocked, please enter your contact details and we will notify you instantly.